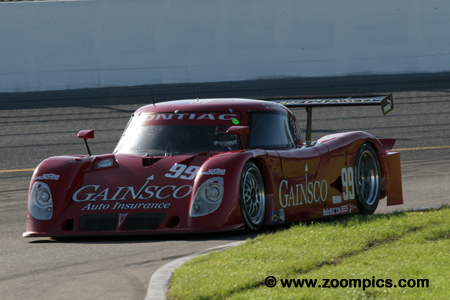 The 2007 Grand American Road Racing Championship (Grand Am) was in its eighth season. A business model which controlled costs, had stable rules and avoided being on dependent of automotive manufacturers attracted many private teams. Based on the failure, of its predecessor, the United States Road Racing Championship in 1999 critics suggested that the Grand Am would suffer a similar fate. This was proving not to be the case as entries were continuing to grow with each year. Daytona Prototype (DP): This class was introduced in 2003 and was established to replace the two existing Sports Racing Prototype groups. To control costs, the cars used a tube frame chassis rather than the expensive composites used to construct most prototype race cars. Also, expenses were contained by limiting modifications and implementing rules that would be in place for five years. Approved to produce the first generation of Daytona Prototypes - for a cost of approximately $400,000 were: Riley Technologies, Doran Designs, Crawford Race Cars, Fabcar Engineering, Chase Competition Engineering, Picchio and Multimatic. Costs were also controlled by restricting the engines to production based motors supplied by Pontiac, Lexus, BMW, Porsche, Ford and Infiniti. Engine displacement was used to determine the weight of a car and whether a five or six-speed transmission could be utilized. Grand Touring (GT): In 2004, there were two production-based classes: Grand Touring and Super Grand Sport which initially competed in the Grand Am Cup division. These two categories were combined into a single class in 2005. Participating in this group are manufacturers such as Porsche, BMW, Chevrolet, Mazda, Ferrari and Pontiac. As with the Daytona Prototypes, engine displacement was used to establish the weight of different makes and models. As in the past, the season opened in January with the Rolex 24 at Daytona International Speedway and ended in Utah at Miller Motorsports Park. In between these two venues, there were events held at Autodromo Hermanos Rodriguez, Homestead-Miami Speedway, Mazda Raceway Laguna Seca, Lime Rock Park, Watkins Glen, Barber Motorsports Park, Mid-Ohio, Virginia International Raceway, Montreal, Iowa and Infineon Raceway. New for this season were Montreal and Iowa and gone from the schedule was Long Beach and Phoenix International Raceway. There was a total of fifteen events with the series competing at Daytona and Watkins Glen twice. 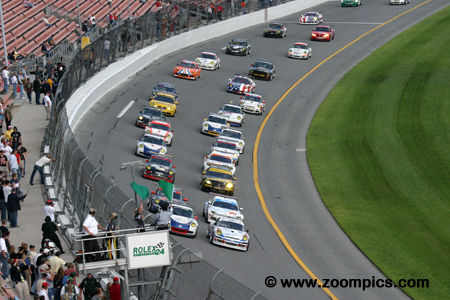 The 45th Rolex 24 at Daytona took place on the weekend of January 27 and 28. There was a total of 70-entries (28-Daytona Prototypes and 42-Grand Touring) which was up from previous year. Drivers would compete for 24-hours on the 12-turn, 3.56-mile track which utilized an infield road course and almost the entire tri-oval. For the second year in a row, Daytona International Speedway management organized a press conference and photo shoot of champions and race winners competing in this year’s Rolex 24. Drivers in this group could claim five NASCAR Cup championships, six Indianapolis 500 wins, five IndyCar Series championships, one Champ Car World Series championship, nine Rolex 24 overall wins, and six Daytona Prototype championships. It is Saturday afternoon, 2:15 pm and twenty-eight Daytona Prototypes are the first receive the green flag for the start of the 45th Rolex 24 at Daytona. The fastest qualifier is Alex Gurney in the Gainsco/Bob Stallings Racing Pontiac Riley. 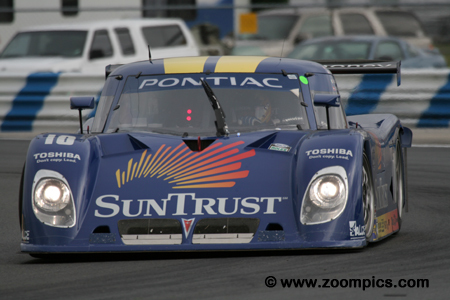 Next to Gurney, is Max Angelelli part of the 2005 winning SunTrust team - also driving a Pontiac-powered Riley. 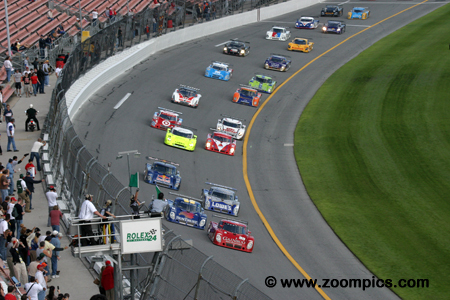 Of the twenty-eight Daytona Prototype starters, seventeen entries would be running at the finish. Sharing the No. 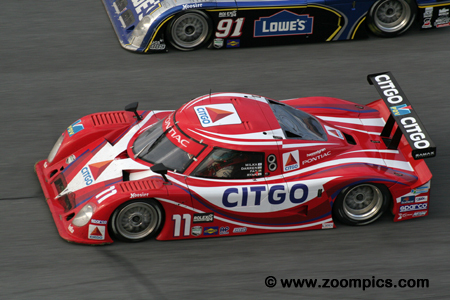 01 Chip Ganassi Racing entry was Juan Pablo Montoya, Salvador Duran and lead driver, Scott Pruett. As usual, Pruett qualified the Lexus-powered Riley but was an uncharacteristic twelfth quickest at the end of the session. The team was in the top-three for most of the race and battled the SunTrust Racing and SAMAX entries in the final hours. The trio prevailed and won the event by 75.842-seconds. Starting from third on the grid was the Matthews Motorsports Riley. Marc Goossens drove the car in qualifying and during the race, his co-drivers were NASCAR star Jimmy Johnson, from IndyCar Ryan Hunter-Reay and team owner, Jim Matthews. The team was competitive early in the contest but Matthews had contact with another competitor and the car suffered a series of issues – they retired when the engine failed. Patrick Huisman was given the qualifying duties for the No. 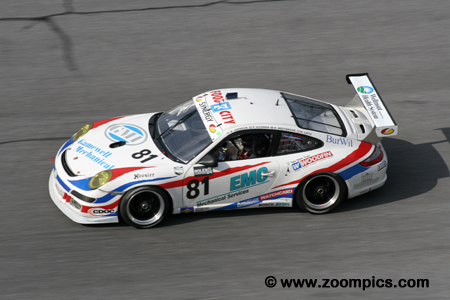 81 Synergy Racing Porsche GT3 Cup. 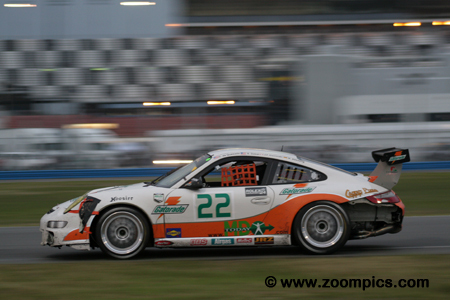 And he delivered, Huisman captured the GT pole beating Wolf Henzler who had earned the top spot in 2005 and 2006. During the race, the Synergy Porsche dropped down the lap chart but was still in the top ten when it suffered severe damage during a restart. 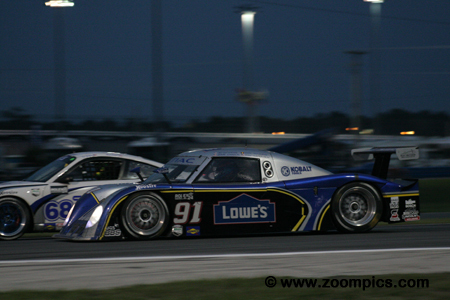 The extended stop for repairs caused the team to finish eleventh in the GT class. For the last two years Wolf Henzler has taken the GT pole position but this season he had to settle for second quickest. Sharing the Tafel Racing with Henzler were Eric Lux, Dominik Farnbacher and team owner, Jim Tafel. Henzler led the opening laps but mechanical issues and accident damage caused by Lux prevented any chance for a good finish. The team eventually retired with suspension problems. 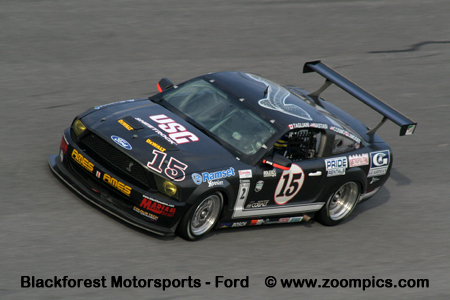 The Grand Am series used a split start for their two classes. First were the Daytona Prototypes which were followed by the Grand Touring cars. Leading the way for the GT cars is Patrick Huisman in the Synergy Racing Porsche and beside him the Tafel Racing entry driven by Wolf Henzler. In total, there were forty-two entries in this category. Starting eleventh on the grid were drivers - Carlos de Quesada, Jean-Francois Dumoulin, Scooter Gabel and Marc Basseng in the Alegra Motorsports/Fiorano Racing Porsche GT3 Cup. Gabel slid off the track early in the event but after that, the team was able to regroup and run a steady race. Taking advantage of the misfortunes of quicker competitors, they found themselves in the lead during the final hour and held on for the GT class win. The No. 11 SAMAX Riley MK XI was co-driven by Milka Duno, Patrick Carpentier, Darren Manning and Ryan Dalziel. The Riley started from the fifth position on the grid. In contention, for most of the race, the Peter Baron team found themselves in a three-way battle with the Ganassi and Suntrust Rileys. At the checkered flag, they were second – just 75.842-seconds behind the winning team. As the lead driver for SunTrust Racing, Max Angelelli was given the job of qualifying. For the fourth time, Angelelli would start the No. 10 Riley from the outside of the front row. Angelelli and his co-drivers Wayne Taylor, Jeff Gordon and Jan Magnussen were in the top-ten until they had an issue with the ECU and lost five laps. The team fought back and made up three of those laps – they were third at the finish. 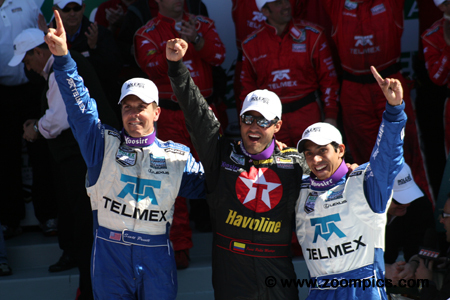 Scott Pruett celebrates the overall and Daytona Prototype class victory with teammates Juan Pablo Montoya and Salvador Duran. 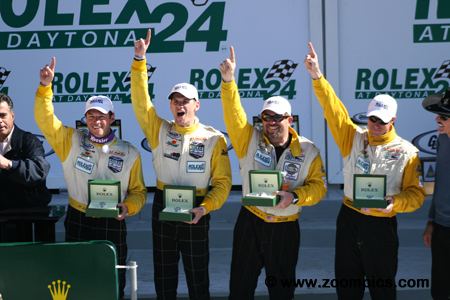 For team owner, Chip Ganassi this was his second Rolex 24 victory. This first 24-Hour win for Montoya and Duran. 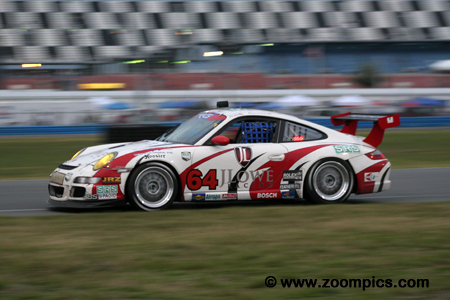 As for Pruett, he now had two overall victories and seven class wins. 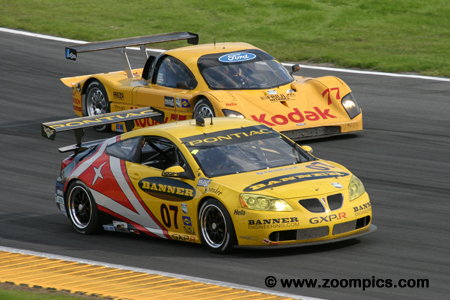 Making a debut at the 2007 Rolex 24 was the Pontiac GXP.R. There were three entered two of which were prepared by Banner Racing. Sharing the No. 07 Pontiac were GM drivers - Paul Edwards, Kelly Collins, Andy Pilgrim and Johnny O’Connell. The new GXP.R showed great promise, leading a number of laps. At the end of twenty-four hours, the team finished second and was just 7.072-seconds behind the winning Porsche. As usual, The Racer’s Group (TRG) had a large group of Porsches entered in the Grand Touring category – five in total. Sharing the No. 64 car was Jim Lowe, Jim Pace, Johannes Van Overbeek and Ralf Kelleners. This group started forty-fifth overall and seventeenth in class – not the quickest of the TRG entries. However, at the end of twenty-four hours, they were the highest place TRG team – finishing third in class. Starting on the pole was Alex Gurney in the No. 99 Pontiac-powered Riley. Forty-five years earlier, Gurney’s father, Dan won a three-hour endurance race at Daytona. But the team’s luck would come to an end in the first ten minutes of the contest when Gurney hit a slower Porsche. After a host of mechanical issues, Gurney and his teammates – Bob Stallings, Jon Fogarty and Jimmy Vasser finally retired with transmission problems. Early in the qualifying session, Sylvain Tremblay was at the top of the charts but when the session ended he was third quickest. 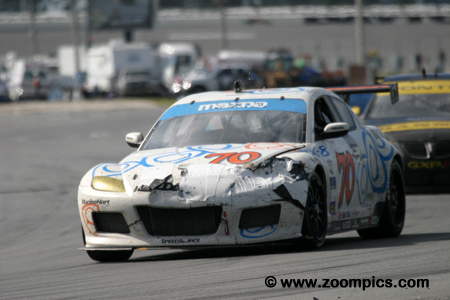 Team principal, Tremblay raced the SpeedSource Mazda RX-8 with David Haskell, Nick Ham and Randy Pobst. The Mazda was involved in a restart incident that required a pit-stop. Repairs were made quickly and the team did not lose too much time. At the checkered flag, they were fifth in class. With the depth of the driving talent in the GT category, it may have been a surprise to see the eleventh quickest qualifier on the victory podium. But the team did include some talented drivers and despite some setbacks, they were able to capitalize on the misfortunes of their competitors. From left to right are - Jean-Francois Dumoulin, Marc Basseng, Carlos de Quesada and Scooter Gabel.